1. Legally recognised as the supplier of goods or services. 2. Proper accounting of taxes paid on the input goods or services which can be utilised for payment of GST due on supply of goods or services or both by the business. 3. Legally authorised to collect tax from his purchasers and pass on the credit of the taxes paid on the goods or services supplied to purchasers or recipients. Where an application for registration has been submitted by the applicant after thirty days from the date of his becoming liable to registration, the effective date of registration shall be the date of grant of registration. In case of registration on his own accord, i.e taking registration voluntarily while being within the threshold exemption limit for paying tax the effective date of registration shall be the date of order of registration. Any supplier who carriers on any business at any place in India and whose aggregate turnover exceeds threshold limit as prescribed in a year is liable to get himself registered. However, certain categories of persons mentioned in Schedule III of MGL are liable to be registered irrespective of this threshold. According to the Section 9(1) an agriculturist shall not be considered as a taxable person and shall not be liable to take registration. 3. Exports of goods and / or service of a person having the same PAN. The above shall be computed on all India basis and excludes taxes charged under the CGST Act, SGST Act and the IGST Act. Aggregate turnover does not include value of supplies on which tax is levied on reverse charge basis, and value of inward supplied. 11. Such other person or class of persons as may be notified by the Central Government or a State Government on the recommendations of the Council. As per sub section (1) of Section 19 of Model GST Law, every person who is liable to take a Registration will have to get registered separately for each of the States where he has a business operation and is liable to pay GST. According to Subsection (2) of Section 19, a person having multiple business verticals in a State may obtain a separate registration for each business vertical, subject to such conditions as may be prescribed. As per Sub-section (3) of Section 19, a person, through not liable to be registered under Schedule III, may get himself registered voluntarily, and all provisions of this Act, as are applicable to a registered taxable person, shall apply to such person. Every person shall have a Permanent Account Number issued under the Income Tax Act, 1961(43 of1961) in order to be eligible for grant of registration. However as per section 19 (4A) of Model GST Law, PAN is not mandatory for a non-resident taxable person who may be granted registration on the basis of any other document equalling to PAN and as may be prescribed. 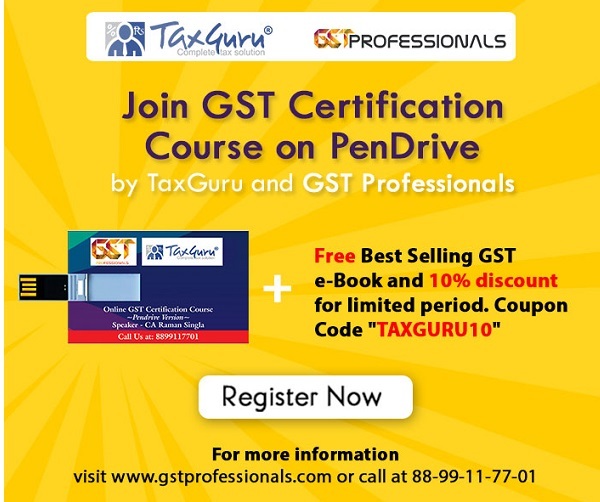 According to sub-section (5) of Section 19, where a person who is liable to be registered under this Act fails to obtain registration, the proper officer may, without prejudice to any action that is, or may be taken under the Model GST Law, or under any other law for the time being in force, proceed to register such person in the manner as may be prescribed. As per sub-section 7 of Section 19 of Model GST Law, the proper officer can reject an application for registration after due verification. However, it is also provided in sub-section 8 of Section 19, the proper officer shall not reject the application for registration or the Unique Identity Number without giving a notice to show cause and without giving the person a reasonable opportunity of being heard. The registration Certificate once granted is permanent unless it is surrendered, cancelled, suspended or revoked. All UN bodies Consulate or Embassy of foreign countries and any other class of persons so notified would be required to obtain a unique identification number (UIN) from the GST portal. The structure of the said ID would be uniform across the States in conformity with GSTIN structure and the same will be common for the Centre and the States. This UIN will be needed for claiming refund of taxes paid by them and for any other purpose as may be prescribed in the GST Rules. The taxable supplier supplying to these organisations is expected to mention the UIN on the invoices and treat such supplies as supplies to another registered person (B2B) and the invoices of the same will be uploaded by the supplier. A unique identification number (ID) would be given by the respective State tax authorities through GST portal to Government authorities / PSU’s not making outwards supplies of GST goods (and thus not liable to obtain GST registration) but are making inter-State purchases. Casual Taxable Person has been defined in Section 2(21) of Model GST law. It means a person who occasionally undertakes transactions in a taxable territory where he has no fixed place of business. A taxable person residing outside India and coming to India to occasionally undertake transaction in the Country ut has no fixed place of business in India is a Non-resident taxable person in terms of Section 2(69) of the Model GST law. The certificate of registration issued to a ‘casual taxable person’ or a “non-resident taxable person” shall be valid for a period of ninety days from the effective date of registration. However, the proper officer, at the request of the said taxable person, may extend the validity of the aforesaid period of ninety days by a further period not exceeding ninety days. While a normal taxable person does not have to make any deposit of money to obtain registration, a casual taxable person or a non-resident taxable person shall, at the time of submission of application for registration under sub-section (1) of section 19, make an advance deposit of tax in an amount equivalent to the estimated tax liability of such person for the period for which the registration is sought. If registration is to be extended beyond the initial period of ninety days, an advance additional amount of tax equivalent to the estimated tax liability is to be deposited for the period for which the extension beyond ninety days is being sought. As per Section 20, the proper officer may, on the basis of such information furnished either by the registrant or as ascertained by him, approve or reject amendments in the registration particulars in the manner and within such period as may be prescribed. It is to be noted that permission of the proper officer for making amendments will be required for only certain core fields of information, whereas for the other fields, the registrant can himself carry out the amendments. Any registration granted under this Act may be cancelled by the proper officer, in circumstances mentioned in Section 21 of the Model GST Law. The proper officer may, either on his own motion or on an application filed, in the prescribed manner, by the registered taxable person or by his legal heirs, in case of death of such person, cancel the registration, in such manner and within such period as may be prescribed. As per Section 21 of subsection (6) the cancellation of registration under one Act (say CGST Act) shall be deemed to be a cancellation of registration under the other Act (i.e. SGST Act). According to sub-section (2) of Section 21 of Model GST law; the proper officer can cancel the registration on his own. Such circumstances include not filing return for a continuous period of six months (for a normal taxable person) or three months (for a compounding tax payer), and not commending business within six months from the date of registration. However, as per Section 21(4) before cancelling the registration, the proper officer has to follow the principles of natural justice. If the registration is obtained by means of wilful mis-statement, fraud or suppression of facts as per section 21(3) the registration may be cancelled with retrospective effect by the proper officer. Please note that there is no option to take centralised registration for services under model GST Law. As per Section 19(2) of Model GST law, if the tax payer has different business verticals in one State, he have the option to register such separate business verticals independently. As per section 2(56) of model GST Law, ISD stand for Input Service Distributor. It is basically an office meant to receive tax invoices towards receipt of input services and further distribute the credit to supplier units proportionately. The ISD registration is for one office of the taxpayer which will be different from the normal registration. Different offices of a taxpayer can apply for ISD Registration. In the case of transfer of business is concern the transferee or the successor shall be liable to be registered with effect from such transfer or succession and he will have to obtain a fresh registration with effect from such date. It is clearly mentioned in schedule III of model GST Law. GSTIN shall migrate all the dealers/assesses who are already registered under existing Central Excise/Service Tax and VAT Laws such assessees/dealers to the GSTN network and shall issue GSTIN number and password. They will be asked to submit all requisite documents and information required for registration in an prescribed period of time. Failure to do so will result in cancellation of GSTIN number. The service tax assessees having centralised registration will have to apply afresh in the respective states wherever they have their businesses. Section 43A of Model GST Law does not prescribe that the job worker will have to be compulsorily registered. The goods will be permitted to be supplied from the place of business of a job worker is registered or the principal declares the place of business of the job worker as his additional place of business. The principal place of business and place of business have been separately defined under Section 2(78) & 2(75) of Model GST Law respectively. The taxpayer will have to declare the principal place of business as well as the details of additional places of business in the registration form. A taxable person may prepare his registration application/returns himself or can approach the TRP for assistance. TRP will prepare the said registration document / return in prescribed format on the basis of the information furnished to him by the taxable person. The legal responsibility of the correctness of information contained in the forms prepared by the TRP will rest with the taxable person only and the TRP shall not be liable for any errors or incorrect information. FC shall be responsible for the digitization and / or uploading of the forms and documents including summary sheet duly signed by the Authorised Signatory and given to it by the taxable person. After uploading the data on common portal using the ID and Password of FC, a print-out of acknowledgement will be taken and signed by the FC and handed over to the taxable person for his records. The FC will scan and upload the summary sheet duly signed by the Authorised signatory. If the information and the uploaded documents are found in order, the State and the Central authorities shall approve the application and communicate the approval to the common portal within three common working days. The portal will then automatically generate the Registration certificate. In case no deficiency is communicated to the applicant by both the tax authorities within three common working days, the registration shall be deemed to have been granted as per section 19(9) of model GST Law and the portal will automatically generate the Registration Certificate. If during the process of verification, one of the tax authorities raises some query or notices some error, the same shall be communicated to the applicant and to the other tax authority through the GST Common Portal within 3 common working days. The applicant will reply to the query/rectify the error or answer the query within a period informed by the concerned tax authorities (Normally this period would be given seven days). On receipt of additional document or clarification, the relevant tax authority will respond within seven common working days. In case registration is refused, the applicant will be informed about the reasons for such refusal through a speaking order. The applicant shall have the right to appeal against the decision of the Authority. As per sub-section (10) of Section 19 of Model GST Law, any rejection of application for registration by one authority (i.e. under the CGST Act/SGST Act) shall be deemed to be a rejection of application for registration by the other tax authority (i.e. under the SGST Act / CGST Act).